I am sure there are tons of recipes for Ulli Sambhar on the net,so contemplated a while before posting this.But I believe with each recipe you follow,you add your own touches to it and make it 'your' special dish,so why not post my version,which might be similar to other recipes but is a special in my home.Did I confuse you there? 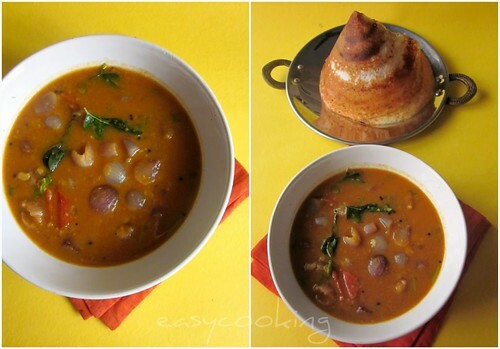 I've been planning to make this sambhar for a while now,ever since amma followed a recipe from a Cookery show and tried it out.No complicated steps and gets done in a jiffy,of course only if you have peeled pearl onions stored in the fridge,and you need a lot of them for this sambhar! Add enough water to cover the toor dal and cook in a pressure cooker for 3-4 whistles or till it becomes soft and mushy. Soak the tamarind in warm water and extract about 1 cup of pulp/juice. In a thick bottomed kadai add oil/ghee and saute the onions till they start to brown[about 5-7 minutes]. Add the chopped tomato along with the tamarind juice and let it cook for about 5 minutes. Mix in the mashed dal,sambhar powder and salt to taste. Let it come to a boil,then simmer for another 5 minutes. Add the coriander leaves and crushed jaggery. Prepare seasoning in a pan with oil/ghee and splutter mustard seeds and jeera.Add curry leaves. 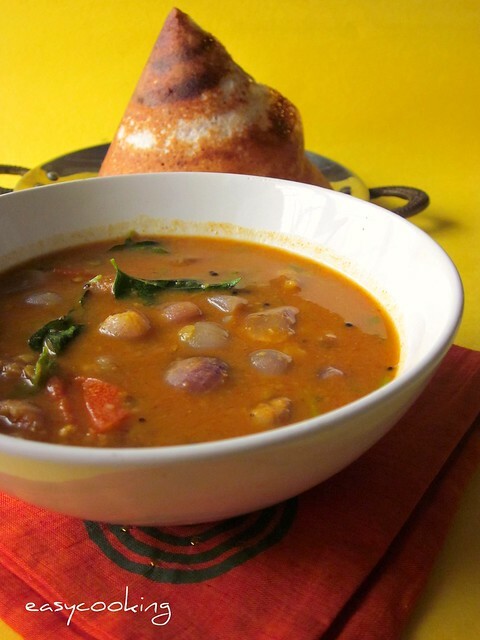 Add the seasoning to the sambhar and add a tsp of ghee before serving[optional]. You could substitute Toor dal with Moong dal with great results.A friend of mine who is not very fond of toor dal tried it with moong dal and loved it. Soak the pearl onions in water for about 10 minutes and then peel it,this makes peeling easier. Adding jaggery is optional but highly recommended since jaggery balances the flavor. Depending on whether you are serving the sambhar with dosa or idlis,you would need to add less/more water.Since I was serving it with dosa,I made a slightly thicker version. Sending this to Kerala Kitchen,an event hosted by Magpie and Ria. I love this with idly and some times rice too,drooling! looks delicious..nice tempting pictures..I add a little toasted grated coconut to this..
My eyes are on your dosa.. Looks Perfect and crispy..
Sambar looks awesome as well..
Sambar looks delicious and mouth watering good! I love pearl onions and never tried them in sambhar..looks very inviting! This is all a Sunday brunch should be all about. Love Love love this. I make it quite often too and it remains a favorite of mine always. Thank you so much for such a brilliant recipe! 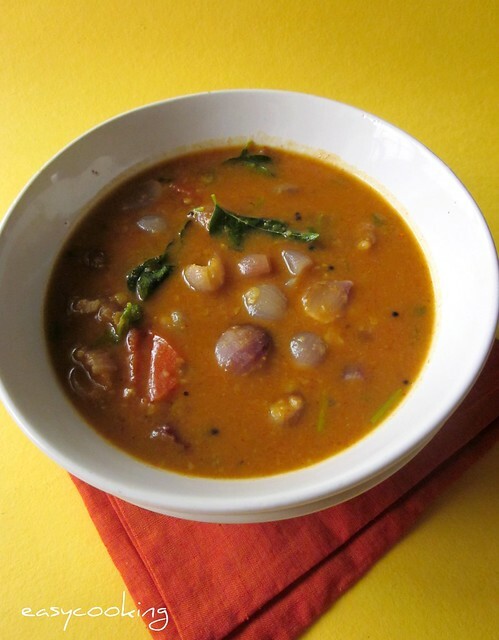 I made this Sambar for Onam and it was fantastic! Do chk out my blog coz Ive posted the recipe and made a dedication to you. Happy to be a follower!